About two weeks ago, a guy called me out of the blue and asks if I can help him find a short sale or foreclosure to buy in the Atlanta area. He explains to me that he is looking to get a great deal on a home and that he is also very handy, so he can do most of the renovations himself. My initial reaction was to tell him that he missed the boat by a couple years… that ship done set sail! But I thought to myself, distressed properties are still out there, we’ll just have to jump on them quickly and make a very strong offers if we’re going to be successful. So I started searching, and… my gut was right, there wasn’t much out there. After about twenty minutes of scouring the MLS, I decided I wanted to dive a little deeper into the numbers for my monthly market update. So, I put together the video below and wrote the following article with some additional insight on the Atlanta real estate market using FMLS data through March 2016. It’s been a few years since foreclosures and short sales dominated the market, so I was worried my market data wouldn’t go back far enough to paint a clear picture of their decline. Luckily, five years of data is enough to show exactly where we came from, and where we are today. As you can see in the chart below, in April 2011 there were 2,827 bank-mediated (includes lender owned, REO and short sales) new listings that hit the market that month. However, as of June 2011, the number of new distressed listings has steadily declined over the past five years. It's hard to believe that there were only 265 new distressed properties listed last month (March 2016). That means, just five years ago there were ten times more distressed properties being listed for sale on a monthly basis. 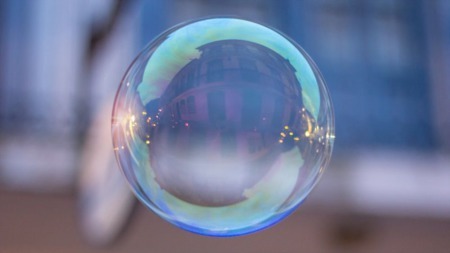 To make things worse for anyone looking to score a deal on one of these properties, the overall inventory of homes for sale is also at extreme lows. With stiff competition from home flippers, investors and traditional buyers looking for a steal, it’s hard to find a true bargain these days. 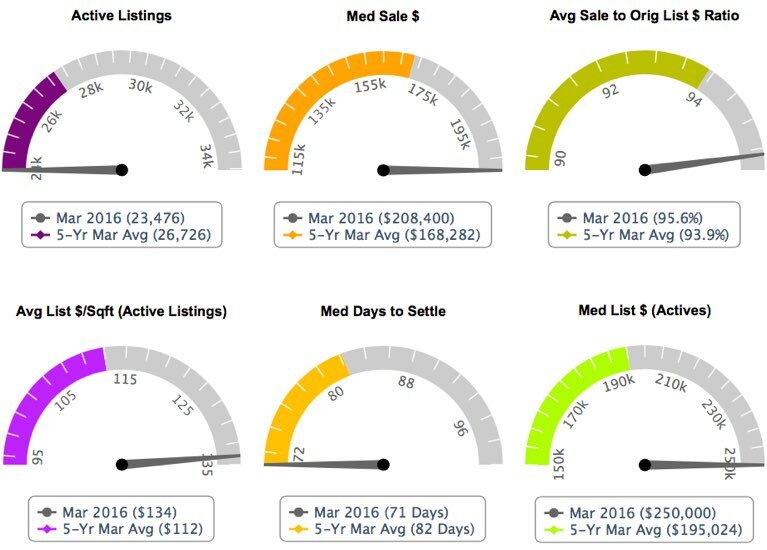 An increase in new listings was definitely a positive sign in March. Looking to take advantage of continued price increases and what seems to be an early spring market, sellers came out in full force. Last month, new listings topped 12,000, representing an 11.4% increase compared to the year prior. 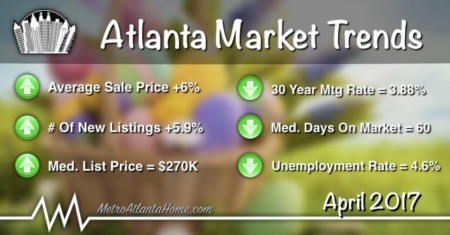 To give you some perspective, the five year March average was only 10,469 new listings. This spike in new listings is welcomed in a market where the inventory has plummeted in recent years. But the question remains, will new listings be able to keep pace with buyer demand? Unfortunately, it appears the influx of new listings can’t keep up with the insatiable appetite of today’s home buyers. Despite having a depleted inventory of homes for sale, new pending contracts jumped 26% year over year! In fact, total pending sales were up 47% year over year, continuing the increasing trend we’ve seen so far this year. I believe this points to a very strong market for sellers as we move into the spring home buying season. However, I’ve been keeping an eye on the running inventory of properties coming back on the market. It’s hard to track, but it appears there is a high number of deals that are falling through for one reason or another. I think buyers are being forced to act quickly and be over aggressive with their offer. Once under contract, many of these buyers realize they aren’t fully able to, or, they simply aren’t ready to buy the home. Since due-diligence is merely an option period, they usually have the ability to walk away without repercussions. Regardless, I expect high buyer demand and historically high pending sales to have a positive impact on home prices this year. Despite massive jumps in year over year pending sales in Janurary, February and March, closed sales were actually down 3.1% in March. This doesn’t seem to make much sense. If YOY pending sales have been significantly higher the past few months, you’d think closed sales would follow the same general trend. February’s closed sales were up (3.4%), but still not in line with the increase in pending transactions. Month over month sales from February to March did increase 28.9% to 6,183, but that is to be expected this time of year. I believe my theory of an increased in buyers terminating contracts is to blame for the drop in sales when compared to the increase in pending contracts. 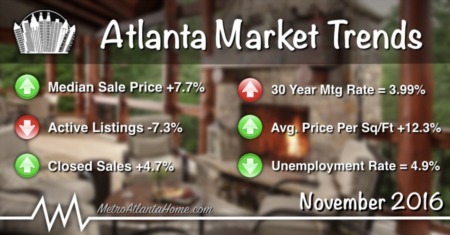 Once again, the average sale price of homes in Metro Atlanta has gone up, now reaching almost $264,000. From February to March, average prices jumped 6.3%, which is typical for this time of year. The year over year increase in average sale prices for March was 6.9%. This increase is in line with what we’ve been seeing throughout the course of the past year. If the shortage of homes for sale persists, and buyer demand continues to remain high, look for average sales prices to continue climbing well into the summer. It appears to me we should easily surpass the five year high mark ($270,715) set last June, in the coming months. Likely a result of low inventory and high buyer demand, the median days to contract already dropped to 28 in the month of March. 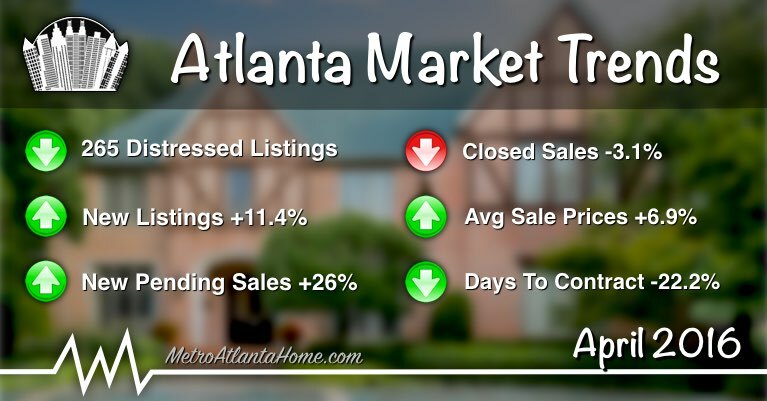 It’s normal for the days on market to start dropping this time of year since the market usually starts to heat up and properties start selling faster. However, this year it seems things got started early, and we’re already seeing houses selling quickly, like they normally do in the summer. In fact, the median days to contract dropped 22.2% from March 2015 (36 days), a time when homes were already selling much quicker than they had in the past. What does this mean? Well, find me a move-in-ready home that is priced at market value, and I’ll show you a multi-buyer bidding war! As it has over the past four years, the median list price per square foot of active listings continues to increase. As you can see in the chart below, when list price per sq/ft increases, it typically does so starting in February. This year, prices seem to have jumped up much more than they had in the past. In February, list prices were up 11.6% YOY, while in March they increased 13.4% YOY. These drastic jumps in list price per sq/ft signal a reaction to the high buyer demand and lack of available inventory. Judging from list prices, it appears agents in general are expecting prices to climb dramatically this year. Despite the higher prices, buyers are in a frenzy over just about anything and everything that hits the market. As of last week, mortgage rates have hit a three year low, which continues to add fuel to home buyer demand. I just checked the Bankrate website and the national average for 30 year conventional loans is currently around 3.62%. According to Lynn Fisher, Vice President of Research and Economics at the Mortgage Bankers Association (MBA), “MBA currently forecasts the Fed will make two more moves to increase rates this year, with the first rate hike forecasted for the June meeting… We think that mortgage rates will rise gradually through the end of the year, averaging about 4.2% in the fourth quarter.”. The way things are going, it would actually be beneficial to the overall market if rates were increased.